To Cite: Itokawa N, Atsukawa M, Tsubota A, Abe H, Shimada N, et al. The Relationship Between 25-Hydroxyvitamin D3 and Hepatitis B Surface Antigen Levels in Patients with Chronic Hepatitis B in Japan, Hepat Mon. 2018 ; 18(5):e63587. doi: 10.5812/hepatmon.63587. Background: Although there are many reports on the relationship between serum 25-hydroxyvitamin D3 levels and chronic liver diseases, the relevance of the former to the latter is still unclear. Objectives: This study aimed at clarifying the relationship between serum 25-hydroxyvitamin D3 levels and HBV-related markers, such as HBV-DNA, hepatitis B surface antigen (HBsAg), and hepatitis B virus core-related antigen (HBcrAg) in patients with chronic hepatitis B. Methods: This was a multicenter retrospective study. The subjects consisted of 236 consecutive untreated patients with chronic hepatitis B. Serum 25-hydroxyvitamin D3 levels were measured by double-antibody radioimmunoassay. The 25-hydroxyvitamin D3 levels were divided to three groups: ≤ 20 ng/mL for deficiency, 21 to 29 ng/mL for insufficiency, and ≥ 30 ng/mL for sufficiency. Results: The subjects consisted of 127 males and 109 females, with a median age of 57 years (range, 15 to 84 years). The patients with positive HBeAg and genotype C accounted for 14.4% and 63.1%, respectively. The median HBV-DNA level and HBsAg level were 684 IU/mL and 750 IU/mL, respectively. The median serum 25-hydroxyvitamin D3 level was significantly lower in patients (21.0 ng/mL) than in healthy volunteers (25.0 ng/mL, P = 0.013). The median serum 25-hydroxyvitamin D3 level in patients with a serum HBsAg level ≥ 1000 IU/mL was significantly lower than that in patients with a serum HBsAg level of < 1000 U/mL (P = 8.06 × 10-3). The incidence of the HBsAg level ≥ 1000 IU/mL was 55.8% in patients with vitamin D deficiency and 38.2% in patients with vitamin D insufficiency/sufficiency (P = 8.92 × 10-3). On multivariate analysis, female gender, the cold season, and a serum HBsAg level of ≥ 1000 IU/mL were independently associated with vitamin D deficiency. From the opposite viewpoint, vitamin D deficiency and high serum HBcrAg level were independent factors associated with an HBsAg level of ≥ 1000 IU/mL. Conclusions: This study suggests that serum vitamin D level is closely and negatively correlated with the HBsAg level in chronic hepatitis B patients. Hepatitis B virus (HBV) infection is one of the most critically infectious diseases around the world. Despite the development of effective vaccinations, ≥ 240 million people still experience persistent HBV infection (1). Chronic hepatitis B (CHB) increases the risk of liver cirrhosis and hepatocellular carcinoma (2). Specifically, the level of serum hepatitis B surface antigen (HBsAg), as well as HBV viral load, is closely related to carcinogenesis. The incidence of hepatocellular carcinoma is significantly increased in patients with an HBV-DNA level of ≥ 2,000 IU/mL. Even if an HBV-DNA load is below 2000 IU/mL, the carcinogenic rate still remains high in patients with an HBsAg level of ≥ 1000 IU/mL (3). The main functions of vitamin D (VD) include calcium absorption in the small intestine and regulation of the calcium level through bone resorption (4). The other functions of VD on various substances/tissues have also attracted attention (5). Vitamin D has a regulatory role in innate and acquired immunity (6), and therefore, regulates various diseases, including tuberculosis (7), coronary artery disease (8), diabetes/insulin resistance (9), and cancer (10). Vitamin D is also associated with chronic liver disease, including chronic hepatitis C (CHC) (11-13) and CHB (14-16). In one study, a low serum VD level was associated with marked HBV replication (14). In another study, the serum VD level had no relevance to HBV viral load (15), and yet another study revealed that the serum VD level had no impact on anti-HBV treatment (16). Therefore, the involvement of VD in CHB is controversial and does not reach a definitive conclusion. In Japan, no study has reported the clinical relevance of serum VD level in patients with CHB. The purpose of this study was to investigate whether serum VD levels could be involved in HBV-related markers, including the HBsAg level, which is closely related to carcinogenesis and is used as an ultimate end-point marker of CHB treatment, in patients with CHB in Japan. Consecutively untreated patients with CHB were enrolled in this study between April, 2013 and April, 2017 at the Nippon Medical school Chiba Hokusoh hospital, Jikei University Katsushika Medical Center, and Otakanomori Hospital. Leading inclusion criteria were as follows: i, HBsAg persistently seropositive for ≥ 6 months; ii, being treatment-naive; iii, patients’ statuses graded 0 or 1 according to the Eastern cooperative oncology group performance status criteria. Exclusion criteria were as follows: i, coinfection with HCV or human immunodeficiency virus; ii, amount of ethanol intake ≥ 60 g/day; iii, the presence of other chronic liver diseases, such as autoimmune hepatitis and primary biliary cholangitis; iv, the presence of hepatocellular carcinoma; v, receiving chemotherapy for any diseases; and vi, taking supplements including VD. The control group consisted of 80 gender-, age-, and collection season-matched healthy volunteers, who registered between April, 2013 and April, 2017. This study was conducted in accordance with the Helsinki declaration and was approved by the ethics review board of Nippon Medical school Chiba Hokusoh hospital. Written informed consent was obtained from all patients. Blood cell count and serological biochemical tests were obtained at the start of this study. Serum hepatitis envelope antigen (HBeAg) and antibody to the hepatitis B envelope antigen (HBeAb) were measured using Architect HBeAg and HBeAb assay kits (Abbott, Illinois, USA). Hepatitis B Virus genotypes were determined with a commercial kit, using a combination of epitopes expressed on the pre-S2 region product (HBV Genotype EIA; Institute of Immunology, Tokyo, Japan). Serum HBV-DNA levels were quantified using Cobas TaqMan HBV v.2.0 (Roche Diagnostics, Tokyo). Serum HBsAg levels were quantified using the Architect HBsAg QT assay kit (Abbott Laboratories, Tokyo). Serum hepatitis B virus core-related antigen (HBcrAg) levels were quantified using a fully automated analyzer system (Lumipulse System; Fujirebio, Tokyo). Based on the HBV-DNA level, the subjects were divided to two groups: a group with an HBV-DNA-level ≥ 2000 IU/mL and a group with < 2000 IU/mL. Based on the HBs antigen level, patients were divided to two groups: a group with HBs antigen level ≥ 1000 IU/mL and a group with < 1000 IU/mL. All HBV-related markers were measured at the start of this study. Serum 25-hydroxyvitamin D3 levels were measured using a double-antibody radioimmunoassay kit (SRL Inc., Tokyo). Serum VD levels were classified to three groups: ≤ 20 ng/mL for VD deficiency, 21 to 29 ng/mL for VD insufficiency, and ≥ 30 ng/mL for VD sufficiency (17). The cases, for whom the serum VD levels were measured between May and October (period during long daylight hours), were defined as the “warm season” group, and those between November and April (period during short daylight hours), were defined as the “cold season” group. Serum hyaluronic acid, type 4 collagen-7S levels, and WFA+-Mac-2 binding protein were measured as liver fibrosis markers at the start of this study. The FIB-4 index was also calculated as a fibrosis marker (18). A FIB-4 index of ≥ 3.25 was defined as advanced liver fibrosis. The measurement of the liver stiffness was performed by transient elastography using a FibroScan (EchoSens, Paris, France). Liver stiffness was expressed as Kilopascals (kPa) and recorded as the median value of all measurements. Patients that reported a liver stiffness value of ≥ 7 kPa were regarded as having advanced liver fibrosis (19). All statistical calculations were performed using the SPSS version 20.0 software (IBM Japan, Tokyo). A P value of < 0.05 was regarded as significant. The differences between the two groups with varying variables were examined using the Mann-Whitney U-test or Fisher’s exact test, as appropriate. Logistic regression analysis for univariate comparison was performed to investigate whether each factor was associated with VD deficiency and a serum HBsAg level ≥ 1,000 IU/mL, respectively. Multiple logistic regression analysis was performed to identify significant and independent factors that influenced VD deficiency and a serum HBsAg level ≥ 1000 IU/mL, respectively. This study cohort included 236 patients, who met the inclusion criteria and were subjected to analysis (Table 1). The patients consisted of 127 males (53.8%) and 109 females (46.2%), with a median age of 57 years (range: 15 to 84 years). There were 33 HBeAg-positive patients (14.4%) and 203 HBeAg-negative patients (85.6%). Hepatitis B virus genotype A, B, and C were detected in 23 (9.7%), 41 (17.4%), and 149 (63.1%) patients, respectively. The median HBV-DNA and HBsAg levels were 684 IU/mL (range: not detected-1.72 × 108 IU/mL) and 750 IU/mL (range: 0.05 to 1.25 × 105 IU/mL), respectively. Other factors, including liver fibrosis markers, are shown in Table 1. Samples were collected during the cold season in 125 patients and during the warm season in 111 patients. Abbreviations: HBeAg, Hepatitis Envelope Antigen; HBcrAg, Hepatitis B Virus Core Related Antigen; HBsAg, Hepatitis B Surface Antigen; n.d, Not Detected; WFA+, Wisteria Floribunda Agglutinin-Positive. aCategorical variables are given as number. Continuous variables are denoted by a given as median (range). The serum 25-hydroxyvitamin D3 level was significantly lower in patients with CHB than in healthy volunteers (P = 0.013, Figure 1A). Among patients with CHB, serum 25-hydroxyvitamin D3 levels were classified as deficient in 47.9%, insufficient in 34.3%, and sufficient in 17.8%. Among the healthy volunteers, serum 25-hydroxyvitamin D3 levels were classified as 33.7%, 40.0%, and 26.3%, respectively. 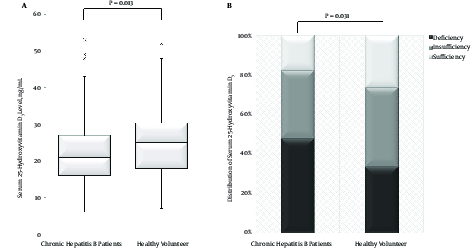 The proportion of VD deficiency in patients with CHB was significantly higher than that in healthy volunteers (P = 0.031, Figure 1B). Figure 1. Comparison of serum 25-hydroxyvitamin D3 levels between patients with chronic hepatitis B and healthy volunteers. A, The serum 25-hydroxyvitamin D3 level was significantly lower in patients with chronic hepatitis B than in healthy volunteer (P = 0.013). B, The distribution of sub-groups classified by serum 25-hydroxyvitamin D3 levels in chronic hepatitis B patients and healthy volunteers. The incidence of vitamin D deficiency in patients with chronic hepatitis B was significantly higher than that in healthy volunteers (P = 0.031). Serum 25-hydroxyvitamin D3 levels were classified to three sub-groups: ≤ 20 ng/mL for vitamin D deficiency, 21 - 9 ng/mL for vitamin D insufficiency, and ≥ 30 ng/mL for vitamin D sufficiency. Among patients with CHB, the serum 25-hydroxyvitamin D3 level in males (median, 25.0 ng/mL; range, 9 to 48 ng/mL) was significantly higher than in females (median, 19.0 ng/mL; range, 6 to 53 ng/mL; P = 4.09 × 10-5, Figure 2A). The serum 25-hydroxyvitamin D3 level in the cold season group (median, 18.0 ng/mL; range, 8 to 40 ng/mL) was significantly lower than in the warm season group (median, 24.0 ng/mL; range 6 to 53 ng/mL; P = 6.09 × 10-3, Figure 2B). Regarding HBV-related markers, there was no difference in the serum 25-hydroxyvitamin D3 level between HBeAg-positive patients (median, 22.5 ng/mL; range, 9 to 43 ng/mL) and HBeAg-negative patients (median, 21.0 ng/mL; range, 6 to 53 ng/mL; P = 0.401). The serum 25-hydroxyvitamin D3 level in patients with genotype C (median, 21.0 ng/mL; range, 8 to 53 ng/mL) was lower than that in patients with other genotypes (median, 24.0 ng/mL; range, 6 to 48 ng/mL), though not statistically significant. As for fibrosis markers, there was no difference in the serum hyaluronic acid levels, the serum type 4 collagen-7S levels, and the M2BPGi levels between patients with VD deficiency and patients with VD insufficiency/sufficiency. Figure 2. Serum 25-hydroxyvitamin D3 levels according to gender and season. A, Gender: the serum 25-hydroxyvitamin D3 level in female patients was significantly lower than that in male patients (P = 4.09 × 10-5). B, Season; the serum 25- hydroxyvitamin D3 level in the “cold” group (sampling between November and April) was significantly lower than that in the “warm” group (sampling between May and October) (P = 6.09 × 10-3). Bold lines denote median. When stratified by the serum VD level, there was no difference in the HBV-DNA level between patients with VD deficiency and patients with VD insufficiency/sufficiency. When stratified by the serum HBV-DNA level, the median serum 25-hydroxyvitamin D3 level was 22.5 ng/mL (range, 6 to 48 ng/mL) in patients with an HBV-DNA level ≥ 2000 IU/mL and 20.0 ng/mL (range, 8 to 53 ng/mL) in patients with an HBV-DNA level < 2000 IU/mL (not significant, P = 0.198). The incidence of VD deficiency was 43.4% (46 of 106) in the former and 51.5% (67 of 130) in the latter (not significant). The HBsAg level was ≥ 1000 IU/mL in 63 of 113 (55.8%) patients with VD deficiency and in 47 of 123 (38.2%) patients with VD insufficiency/sufficiency (P = 8.92 × 10-3, Figure 3A). From the opposite viewpoint, the serum 25-hydroxyvitamin D3 level in patients with an HBsAg level ≥ 1000 IU/mL (median, 18.0 ng/mL; range, 6 to 40 ng/mL) was significantly lower than that in patients with an HBsAg level < 1000 IU/mL (median, 20.0 ng/mL; range, 8 - 53 ng/mL; P = 8.06 × 10-3, Figure 3B). 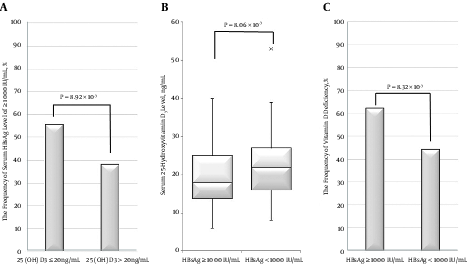 In addition, the incidence of VD deficiency in patients with an HBsAg level ≥ 1,000 IU/mL (62.0%; 62 of 100) was significantly higher than that in patients with an HBsAg level < 1,000 IU/mL (44.1% (60 of 136); P = 8.32 × 10-3, Figure 3C). Univariate analysis showed a significant association between VD deficiency and the following factors: female gender, cold season, serum HBsAg level ≥ 1000 IU/mL, and high platelet count. 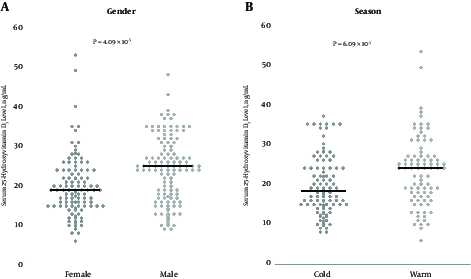 Multivariate analysis indicated that female gender (P = 8.04 × 10-5, odds ratio (OR): 3.119), cold season (P = 0.018, OR: 1.970), and serum HBsAg level ≥ 1000 IU/mL (P = 0.019, OR: 2.005) were significantly independent factors (Table 2). Abbreviations: HBeAg, Hepatitis Envelope Antigen; HBcrAg, Hepatitis B Virus Core Related Antigen; HBsAg, Hepatitis B Surface Antigen; OR, Odds Ratio; WFA+, Wisteria Floribunda Agglutinin-Positive; 95% CI, 95% Confidential Interval. aVitamin D deficiency was defined as serum 25-hydroxyvitamin D3 levels of ≤ 20 ng/mL. b“Cold” season was defined as blood draw for measurement of serum 25-hydroxyvitamin D3 level between November and April. Univariate analysis of factors associated with serum HBsAg level ≥ 1000 IU/mL identified younger age, VD deficiency, high serum HBcrAg level, high platelet count, and FIB-4 index < 3.25. Multivariate analysis identified VD deficiency (P = 0.011, OR: 2.348) and high serum HBcrAg level (P = 1.74 × 10-4, OR: 2.145) as independent factors (Table 3). a“Cold” season was defined as blood draw for measurement of serum 25-hydroxyvitamin D3 level between November and April. bVitamin D deficiency was defined as serum 25-hydroxyvitamin D3 levels of ≤ 20 ng/mL. This is the first report that investigates factors associated with serum 25-hydroxyvitamin D3 level in untreated patients with CHB in Japan. Specifically, this study focused on the relationship between HBsAg and serum 25-hydroxyvitamin D3 levels. This study demonstrated the following findings: i, the serum 25-hydroxyvitamin D3 level was significantly lower and the incidence of VD deficiency was significantly higher in patients than in healthy volunteers; ii, significant factors associated with VD deficiency included female gender, “cold season”, and a serum HBsAg level ≥ 1,000 IU/mL; and iii, VD deficiency was a significant, independent factor associated with serum HBsAg level ≥ 1,000 IU/mL. Previous studies reported the association between serum 25-hydroxyvitamin D3 level and chronic liver disease. In patients with CHC, the serum 25-hydroxyvitamin D3 level was lower compared to that of healthy volunteers (11) and was associated with liver fibrosis (12). Intriguingly, the effect of IFN-based therapy for CHC was improved by supplementing VD3 (13). Additionally, the serum 25-hydroxyvitamin D3 level in patients with non-alcoholic steatohepatitis was lower than healthy volunteers (20) and was negatively correlated with liver fibrosis (21). However, a few studies from Germany and China reported its relevance to the serum 25-hydroxyvitamin D3 level in patients with CHB (14, 15). As reported in a previous study (22), this study also showed that the serum 25-hydroxyvitamin D3 level in untreated CHB patients was significantly lower than that of healthy volunteers. The low VD level may be of great advantage to persistent infection of HBV, because VD is closely related to the host’s innate/acquired immunity and therefore, increases antigen-presenting capacity of dendritic cells and the cytotoxic activity of natural killer cells against external antigens (6). In this study, patients with VD deficiency/insufficiency accounted for 82.2%, which was lower than the incidence reported from Germany (located at a higher latitude when compared to Tokyo) (14), higher than that reported in Guangzhou, China (located at a lower latitude when compared to Tokyo) (15), and similar to that from Chengdu, China (located at a similar latitude when compared to Tokyo) (22). One possible explanation for this variation might be that sunshine hours differ among various latitudes as sunlight-related ultraviolet rays are important for VD synthesis (23). Although serum 25-hydroxyvitamin D3 level differed significantly according to HBV genotypes in previous studies (14, 15), the current study showed that the levels did not differ among genotypes. According to previous reports, the serum 25-hydroxyvitamin D3 level in HBeAg-positive patients was lower than that in HBeAg-negative patients (14-16, 22). However, this study failed to show a similar difference in the serum 25-hydroxyvitamin D3 level between the two patient groups. One possible explanation for this discrepancy is that the HBeAg-positive patients accounted for ≥ 50% in previous studies yet only 14.4% in this study, and that 72.7% of HBeAg-positive and 50.2% of HBeAg-negative patients in this study cohort were male (generally found to have higher VD levels compared to females). Some studies showed that there was a negative correlation between HBV-DNA level and serum 25-hydroxyvitamin D3 level (14, 22), whereas other researches, including the current study, indicated that there was no association between the two factors (15, 16). The variation might be related to differences in the HBV-DNA level among the study populations. For instance, subjects in one study (22) included a large number of HBeAg-positive patients, with a median HBV-DNA level of 6.4 log IU/mL. On the other hand, the population of this study consisted of many HBeAg-negative patients, with a median HBV-DNA level of 2.9 log IU/mL. Furthermore, variations in patient age, HBV genotype, liver fibrosis, and racial/ethnic background could lead to different results. Therefore, a large-scale multinational study should be conducted to accurately evaluate the association between the HBV-DNA level and the serum 25-hydroxyvitamin D3 level. In this study, there was no association between the HBcrAg level and the serum 25-hydroxyvitamin D3 level. In untreated patients with CHB, a positive correlation between the HBcrAg level and HBV-DNA level was reported (24). In this study, there was no association between the HBV-DNA level and the serum 25-hydroxyvitamin D3 level. Therefore, the researchers considered that no association between the HBcrAg level and the serum 25-hydroxyvitamin D3 level was observed. There has been no study on the association between the HBsAg level and the serum 25-hydroxyvitamin D3 level. In this study, an HBsAg level ≥ 1000 IU/mL was more frequently observed in patients with VD deficiency than in those with VD insufficiency/sufficiency. Conversely, the serum 25-hydroxyvitamin D3 level was significantly lower in patients with an HBsAg level ≥ 1000 IU/mL than in those with an HBsAg level < 1000 IU/mL. The incidence of VD deficiency in the former was significantly higher than that in the latter. Furthermore, multivariate analysis in this study emphasized the close association between these two factors. Currently, the final goal of anti-HBV treatment is to achieve HBsAg loss (3). However, currently-available NAs/IFN therapy has limited impact on the reduction of the HBsAg level. A recent study reported the association between response to Peg-IFN therapy and genetic variations involved in VD synthesis (25). Vitamin D supplementation might be effective via immunoregulatory actions (6) in combination with NAs and/or IFN. It is unclear whether VD deficiency has an influence in the state of chronic liver disease, including CHB. At least, as described above, VD might immunologically influence persistent infection and proliferation of hepatitis virus. Therefore, a possibility that the VD deficiency causes high HBsAg level should be considered. On the other hand, a possibility that existence of a chronic liver disease has caused VD deficiency consequently should also be considered. The authors speculate that sunlight exposure time might be short in the patients with CHB because patients with chronic liver disease might go out less frequently than healthy subjects. Thus, short sunshine exposure due to decreased activity associated with the progression of liver disease and decreased function of liver might cause VD deficiency in patients with chronic liver disease. It is conceivable that other independent factors associated with serum 25-hydroxyvitamin D3 level included gender and season of sampling in this multivariate analysis. Females usually tend to avoid sunlight for cosmetic reasons and cultural habits, resulting in the suppression of VD synthesis by ultraviolet rays on the skin (26). However, this study failed to show the association between fibrosis surrogate markers and serum level of 25-hydroxyvitamin D3, partially because this study cohort may have included only a small number of patients with advanced liver fibrosis. In conclusion, this study suggests that serum 25-hydroxyvitamin D3 level is closely and negatively correlated with HBsAg level in patients with CHB in Japan. The authors thank all physicians at all institutions, who were involved in the treatment of patients. They also thank Yoshiko Seki (division of gastroenterology, Nippon Medical school Chiba Hokusoh hospital, Chiba, Japan) for analyzing the data. Authors’ Contribution: All authors contributed towards the assessment of patients, collection of laboratory data, and decision on treatment indication. Dr. Akihito Tsubota contributed to writing the manuscript and critical revision. Conflict of Interest Disclosure: All authors declare no conflict of interest. Financial Disclosure: No potential conflict of interest relevant to this study was reported. Funding/Support: This research was supported by a grant from Nippon Medical school Chiba Hokusoh hospital, Chiba, Japan. 1. World Health Organization . Hepatitis B. Fact Sheet No.204. 2013. 2. Dienstag JL. Hepatitis B virus infection. N Engl J Med. 2008;359(14):1486-500. doi: 10.1056/NEJMra0801644. [PubMed: 18832247]. 3. Tseng TC, Liu CJ, Yang HC, Su TH, Wang CC, Chen CL, et al. High levels of hepatitis B surface antigen increase risk of hepatocellular carcinoma in patients with low HBV load. Gastroenterology. 2012;142(5):1140-1149 e3. quiz e13-4. doi: 10.1053/j.gastro.2012.02.007. [PubMed: 22333950]. 4. Tang BM, Eslick GD, Nowson C, Smith C, Bensoussan A. Use of calcium or calcium in combination with vitamin D supplementation to prevent fractures and bone loss in people aged 50 years and older: a meta-analysis. Lancet. 2007;370(9588):657-66. doi: 10.1016/S0140-6736(07)61342-7. [PubMed: 17720017]. 5. Nagpal S, Na S, Rathnachalam R. Noncalcemic actions of vitamin D receptor ligands. Endocr Rev. 2005;26(5):662-87. doi: 10.1210/er.2004-0002. [PubMed: 15798098]. 6. Manuel Quesada J, Solana R, Serrano I, Barrio V, Martinez ME, Santamaria M, et al. Immunologic effects of vitamin D. N Engl J Med. 1989;321(12):833-4. doi: 10.1056/NEJM198909213211215. [PubMed: 2597268]. 7. Salahuddin N, Ali F, Hasan Z, Rao N, Aqeel M, Mahmood F. Vitamin D accelerates clinical recovery from tuberculosis: results of the SUCCINCT Study [Supplementary Cholecalciferol in recovery from tuberculosis]. A randomized, placebo-controlled, clinical trial of vitamin D supplementation in patients with pulmonary tuberculosis'. BMC Infect Dis. 2013;13:22. doi: 10.1186/1471-2334-13-22. [PubMed: 23331510]. 8. Ginde AA, Scragg R, Schwartz RS, Camargo CJ. Prospective study of serum 25-hydroxyvitamin D level, cardiovascular disease mortality, and all-cause mortality in older U.S. adults. J Am Geriatr Soc. 2009;57(9):1595-603. doi: 10.1111/j.1532-5415.2009.02359.x. [PubMed: 19549021]. 9. Boucher BJ, Mannan N, Noonan K, Hales CN, Evans SJ. Glucose intolerance and impairment of insulin secretion in relation to vitamin D deficiency in east London Asians. Diabetologia. 1995;38(10):1239-45. doi: 10.1007/BF00422375. [PubMed: 8690178]. 10. Giovannucci E, Liu Y, Rimm EB, Hollis BW, Fuchs CS, Stampfer MJ, et al. Prospective study of predictors of vitamin D status and cancer incidence and mortality in men. J Natl Cancer Inst. 2006;98(7):451-9. doi: 10.1093/jnci/djj101. [PubMed: 16595781]. 11. Atsukawa M, Tsubota A, Shimada N, Yoshizawa K, Abe H, Asano T, et al. Influencing factors on serum 25-hydroxyvitamin D3 levels in Japanese chronic hepatitis C patients. BMC Infect Dis. 2015;15:344. doi: 10.1186/s12879-015-1020-y. [PubMed: 26286329]. 12. Petta S, Camma C, Scazzone C, Tripodo C, Di Marco V, Bono A, et al. Low vitamin D serum level is related to severe fibrosis and low responsiveness to interferon-based therapy in genotype 1 chronic hepatitis C. Hepatology. 2010;51(4):1158-67. doi: 10.1002/hep.23489. [PubMed: 20162613]. 13. Atsukawa M, Tsubota A, Shimada N, Kondo C, Itokawa N, Nakagawa A, et al. Efficacy of Alfacalcidol on PEG-IFN/ Ribavirin Combination Therapy for Elderly Patients With Chronic Hepatitis C: A Pilot Study. Hepat Mon. 2013;13(12). e14872. doi: 10.5812/hepatmon.14872. [PubMed: 24403915]. 14. Farnik H, Bojunga J, Berger A, Allwinn R, Waidmann O, Kronenberger B, et al. Low vitamin D serum concentration is associated with high levels of hepatitis B virus replication in chronically infected patients. Hepatology. 2013;58(4):1270-6. doi: 10.1002/hep.26488. [PubMed: 23703797]. 15. Yu R, Sun J, Zheng Z, Chen J, Fan R, Liang X, et al. Association between vitamin D level and viral load or fibrosis stage in chronic hepatitis B patients from Southern China. J Gastroenterol Hepatol. 2015;30(3):566-74. doi: 10.1111/jgh.12783. [PubMed: 25238258]. 16. Chan HL, Elkhashab M, Trinh H, Tak WY, Ma X, Chuang WL, et al. Association of baseline vitamin D levels with clinical parameters and treatment outcomes in chronic hepatitis B. J Hepatol. 2015;63(5):1086-92. doi: 10.1016/j.jhep.2015.06.025. [PubMed: 26143444]. 17. Holick MF. Vitamin D deficiency. N Engl J Med. 2007;357(3):266-81. doi: 10.1056/NEJMra070553. [PubMed: 17634462]. 18. Martinez SM, Crespo G, Navasa M, Forns X. Noninvasive assessment of liver fibrosis. Hepatology. 2011;53(1):325-35. doi: 10.1002/hep.24013. [PubMed: 21254180]. 19. Marcellin P, Ziol M, Bedossa P, Douvin C, Poupon R, de Ledinghen V, et al. Non-invasive assessment of liver fibrosis by stiffness measurement in patients with chronic hepatitis B. Liver Int. 2009;29(2):242-7. doi: 10.1111/j.1478-3231.2008.01802.x. [PubMed: 18637064]. 20. Jablonski KL, Jovanovich A, Holmen J, Targher G, McFann K, Kendrick J, et al. Low 25-hydroxyvitamin D level is independently associated with non-alcoholic fatty liver disease. Nutr Metab Cardiovasc Dis. 2013;23(8):792-8. doi: 10.1016/j.numecd.2012.12.006. [PubMed: 23415456]. 21. Targher G, Bertolini L, Scala L, Cigolini M, Zenari L, Falezza G, et al. Associations between serum 25-hydroxyvitamin D3 concentrations and liver histology in patients with non-alcoholic fatty liver disease. Nutr Metab Cardiovasc Dis. 2007;17(7):517-24. doi: 10.1016/j.numecd.2006.04.002. [PubMed: 16928437]. 22. Chen EQ, Bai L, Zhou TY, Fe M, Zhang DM, Tang H. Sustained suppression of viral replication in improving vitamin D serum concentrations in patients with chronic hepatitis B. Sci Rep. 2015;5:15441. doi: 10.1038/srep15441. [PubMed: 26486883]. 23. Tsiaras WG, Weinstock MA. Factors influencing vitamin D status. Acta Derm Venereol. 2011;91(2):115-24. doi: 10.2340/00015555-0980. [PubMed: 21384086]. 24. Kimura T, Rokuhara A, Sakamoto Y, Yagi S, Tanaka E, Kiyosawa K, et al. Sensitive enzyme immunoassay for hepatitis B virus core-related antigens and their correlation to virus load. J Clin Microbiol. 2002;40(2):439-45. doi: 10.1128/JCM.40.2.439-445.2002. [PubMed: 11825954]. 25. Limothai U, Chuaypen N, Khlaiphuengsin A, Chittmittraprap S, Poovorawan Y, Tangkijvanich P. Association of vitamin-D-related genetic variations and treatment response to pegylated interferon in patients with chronic hepatitis B. Antivir Ther. 2017;22(8):681-8. doi: 10.3851/IMP3154. [PubMed: 28291736]. 26. Bandeira F, Griz L, Dreyer P, Eufrazino C, Bandeira C, Freese E. Vitamin D deficiency: A global perspective. Arq Bras Endocrinol Metabol. 2006;50(4):640-6. doi: 10.1590/S0004-27302006000400009. [PubMed: 17117289].